Just when you thought that Michael Phelps couldn’t get any more amazing, the legendary swimmer finds new ways to amaze the world. Last night on live TV, Phelps proved to the world that he is hands down the greatest swimmer of all time when he beat a horse in a 400-meter swimming race. It was the ultimate battle of man versus nature, and thanks to Michael Phelps’ incredible abilities, mankind has come out on top! When promoters first announced that Michael Phelps would be facing a thoroughbred racehorse in a televised swimming race, even Phelps’ biggest supporters were skeptical that the 23-time Olympic gold medalist would be able to come out on top. The horse Phelps was set to race weighed in at more than 1,000 pounds of pure muscle, and its long legs meant that his swimming stroke would have a much larger span than Phelps’. Still, Phelps never let the daunting task of swimming against a racehorse intimidate him, and by the end of the race, he had climbed out of the pool victorious while the horse hadn’t even finished its first lap! 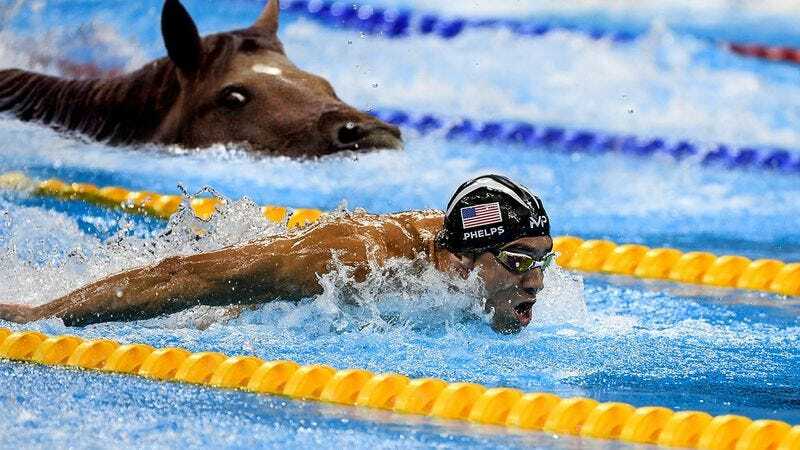 To be fair, Phelps was given a 20-second head start before officials pushed the screaming horse into the pool. This handicap was meant to help offset the horse’s incredible strength, but even with this advantage, it’s still amazing that Phelps was able to outswim such a powerful animal. Think about it: This is a horse capable of comfortably pulling loads of up to 8,000 pounds, and Phelps was able to defeat it in a swimming race with plenty of time to spare! If you ever had any doubts that Michael Phelps was one of the most incredible athletes in the history of the world, his ability to outswim a thoroughbred racehorse should be all the proof you need. By the time officials brought in an industrial crane to fish the drowned horse out of the middle of the pool, Phelps was already in the middle of a press conference talking to the world about his unbelievable victory against nature. Absolutely incredible. Michael Phelps has accomplished many incredible things in his swimming career, but outswimming a horse in a 400-meter race is an astounding achievement that people will be talking about for years to come. There’s simply no way around it: Michael Phelps is the greatest swimmer of all time.